A top layer of fruity sweetness, and a bottom layer of crispy buttery pastry. Serve this with a big dollop of ice-cream and you’ll be laughing. 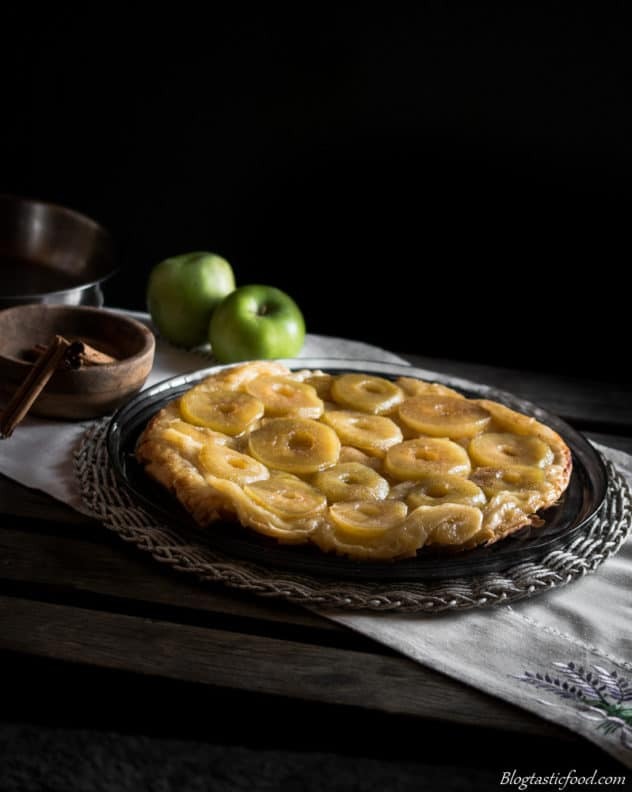 There is nothing like that moment when you flip a tart tatin onto a plate, raising the pan, only see that you’ve made a perfect and beautiful dessert! I actually had to re-do this recipe to fix a few things I wasn’t happy with. One being that the tarte tatin was too wet and syrupy instead golden and caramelised, we’ll go over why this was the case later on. 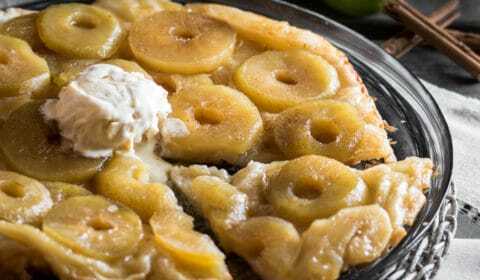 And don’t get me wrong, this dessert is quick and simple to make, but before we actually get to the recipe, I would like to go over some key points when making a tarte tatin. So let’s get into it! The sheets of puff pastry aren’t big enough! So this is a trick I learnt from Donna Hay, who is an incredible Australian chef and I have made many of her recipes (I will link her website at the bottom of the page). I can’t remember exactly what recipe she did this with, but the idea is that this tart tatin needs 2 sheets of puff pastry to coat all of the apples and the caramel in the pan. So instead of just putting 2 over the top, her tip was to take both thawed out sheets and roll them up against on another until you get 1 nice big puff pastry sheet with a larger surface area. Pretty cool huh!? So that is what I like to do with certain recipes that require puff pastry, including this one. Just make sure you have some flour to lightly dust your surface, pastry and rolling pin and you’re good to go. So how do you make the caramel? Ok guys, first things first, let’s just get real here for a second. I ALWAYS say this when I make any recipe that involves a certain form of boiling sugar. 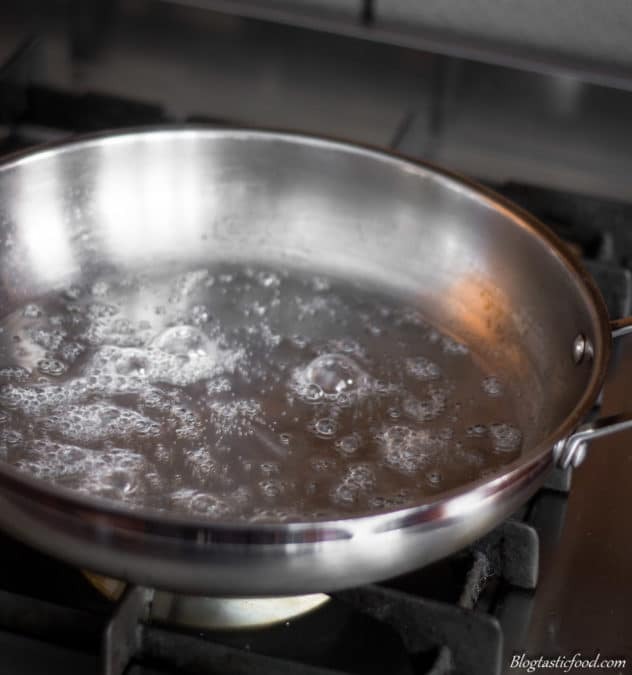 When the syrup or caramel is bubbling away, doing it’s thing….DO….NOT….TOUCH…IT. I hope that’s clear. 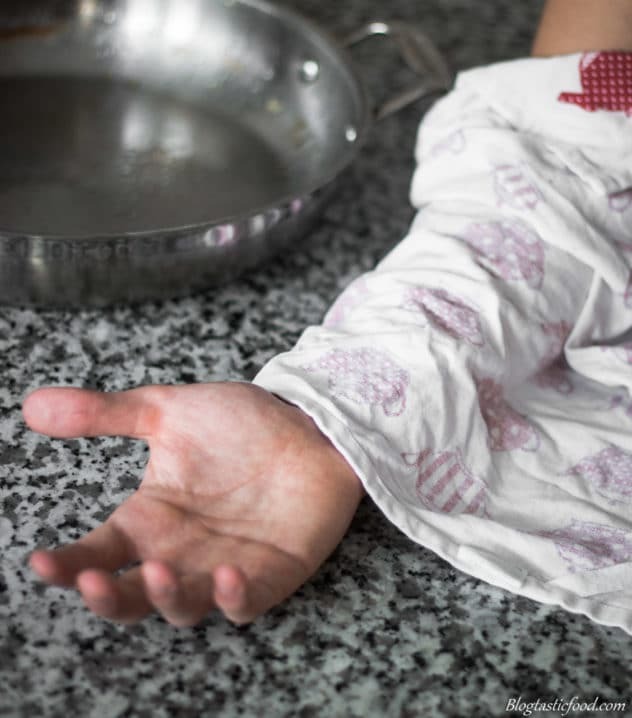 When I was in culinary school, I saw a guy touch the tiniest bit of boiling syrup, it stuck to his finger and burned through 3 layers of his skin…..lucky it was just the tip of his finger huh? So, don’t touch it, and make sure there are no kids mucking about around it. Now that we have that out of the way. It’s really important that you don’t let the sugar crystallise, because if it does your caramel is screwed, and you’ll have to clean the pan and start again. Do that every minute or so and you’ll be fine. Another quick tip, I also like to whisk the water and the sugar together before I start heating it up into a syrup. I do this to try and dissolve as much sugar as possible, which can also help to stop the sugar from crystallising. How do I turn the tart? Now remember folks, the pan will be hot so put a tea-towel or a pair of mittens around the handle to remind yourself of this. No hesitation here people, flip with confidence. If someone is trying to do a backflip, they are much better off doing it with confidence because if they hesitate and half do it, they’ll probably fall on their face. Same deal here, kind of, instead in this case, it will be your beautiful tarte tatin on the floor. So make sure you have a plate or platter big enough to cover the pan you’re using. Place it directly over the pan, then when you flip, do it nice and fast. Simple as that. 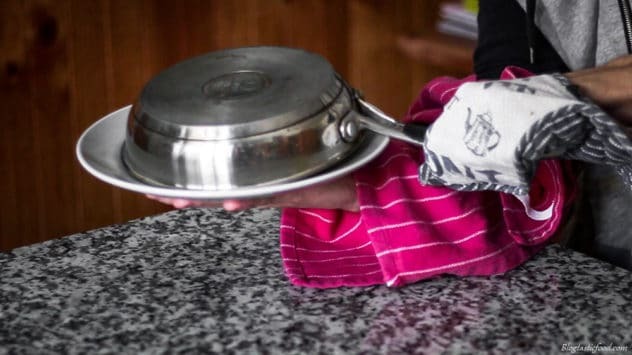 If you want you can wrap a tea-towel around your forearm that’s holding the plate or platter to stop the caramel from hitting your arm, but this has never happened to me. What apples should I use and how do I stop them from browning? I would definitely recommend granny smith apples for 2 reasons. One, it’s tart compared to red apples. Red apples are much sweeter and we already have enough sweetness form the caramel. 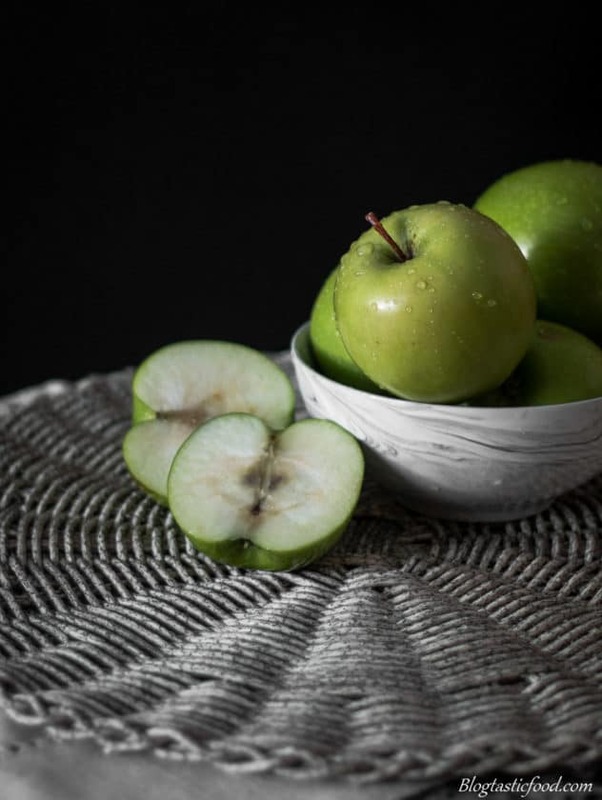 And two, granny smith apples are firmer, so unlike red apples, they will have some texture and won’t turn to mush. You can cut the apples however you like, you can cut them into big rustic chunks, or you can do what I did and use a corer to take out the middle, peel them and then cut them into nice slices. Anything will work. Once the apples are peeled they will start browning, and we don’t want to disappoint whoever we’re trying to impress by serving a tarte tatin covered in brown apples now do we? The solution is simple, have a bowl of water and then when you peel and cut your apples, just place them in the water until you’re ready to use them again. That being said, before you start layering the apples in the pan of caramel, make sure you soak up the water using kitchen paper or a tea-towl. 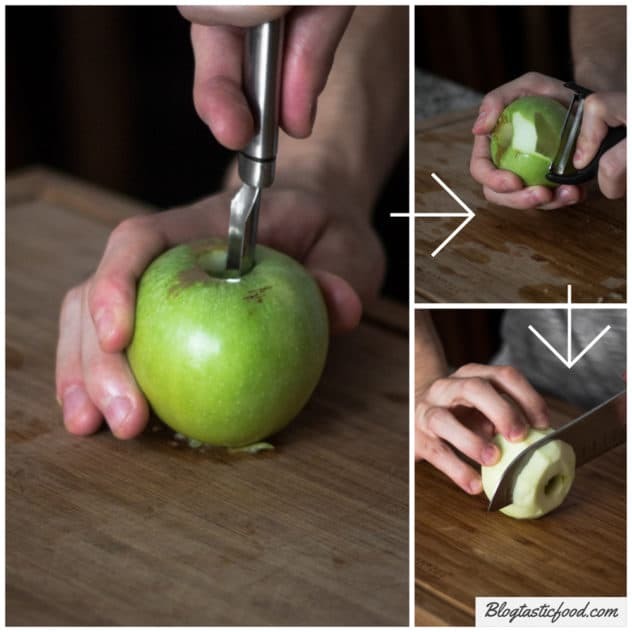 If you don’t do this, the apples will just release all the water it has soaked up when it cooks. And then your tarte tatin will be far too wet, and you won’t get that nice, sticky caramelisation on the apples. Thank you so much for reading this post, I say it all the time and I will continue to say it because this would be nothing without you guys and gals. So I really hope that you get something out of what I post. 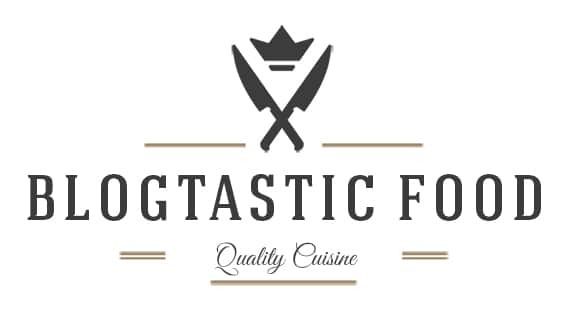 If you would like to subscribe, go ahead and do so as I am always posting new recipes. And if you would like to follow me on social media, I am on Pinterest, Facebook, Twitter and Instagram. Have a great day friends!! Caramelized apples over a thick layer of crispy puff pasty! Even more amazing when served with ice-cream. 4 granny smith apples peeled, cored and then cut in any way you wish, then leave in a bowl of water so they don't go brown. Pre-heat your oven to 190 degrees Celsius. Dust a clean flat surface with your flour, lay one sheet of puff pastry out, then place the other sheet directly over the top. Dust the top of the pastry and your rolling pin, then roll the pastry sheets against one another until you have the approximate thickness of just one sheet. Store the pastry in the fridge until you're ready to use it. 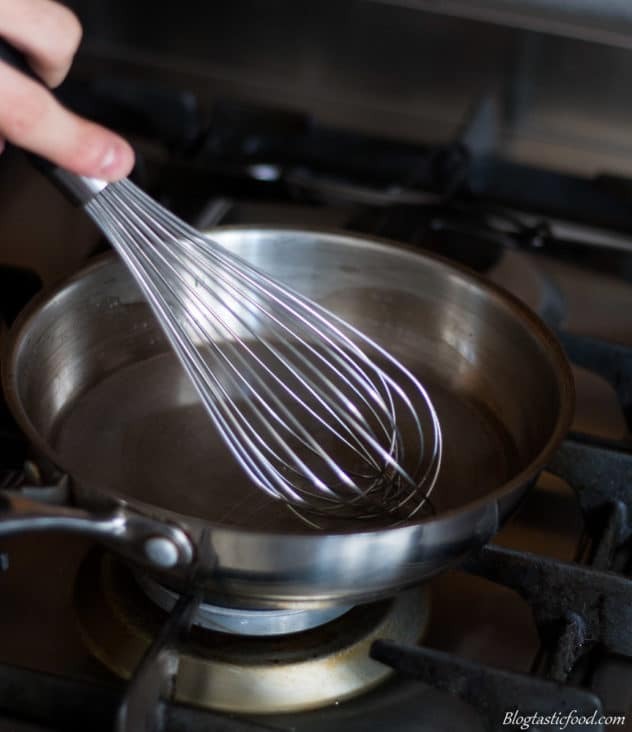 Whisk the sugar and 50ml of water together in a medium sized oven proof pan until the sugar is dissolved. Bring the syrup to a boil, then turn the heat down to about medium. DO NOT touch or taste the syrup/caramel. The temperature of sugar that is boiling or simmering in any form goes higher than 100 degrees and can easily burn through the skin. 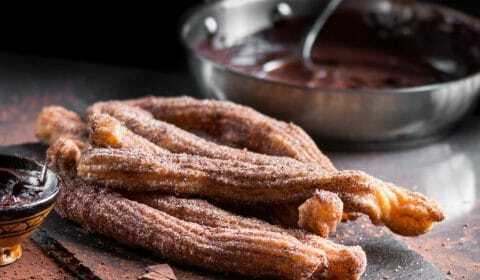 As the sugar syrup is simmering, get a pastry brush and a glass of water. Brush the sides of the pan so it trickles down the edges of the syrup every minute or so. This just helps prevent the sugar from crystallising. Once the syrup has developed a golden colour, take the pan off the heat and carefully add the butter and slowly stir it through. 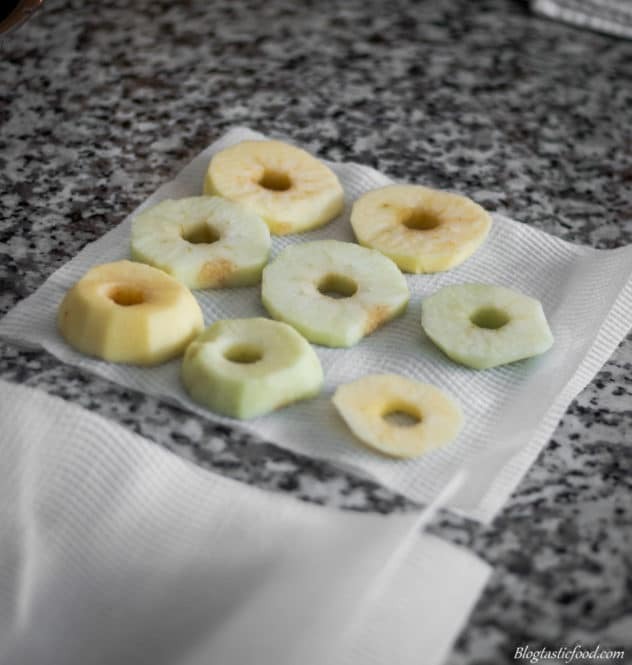 Drain the apples, then dry them out as much as you can with some kitchen paper or a tea towel. Carefully place the cut apple into the pan. Make sure the apples are evenly spread out. Place the puff pastry over the pan, make sure it covers all the apples and the caramel (be very careful when doing this). Get a fork and prick a few holes in the pastry, just to ensure that not too much air builds up as you cook the pastry. Place in the oven and bake for 30-35 minutes, until the pastry is cooked all the way through and is golden brown. 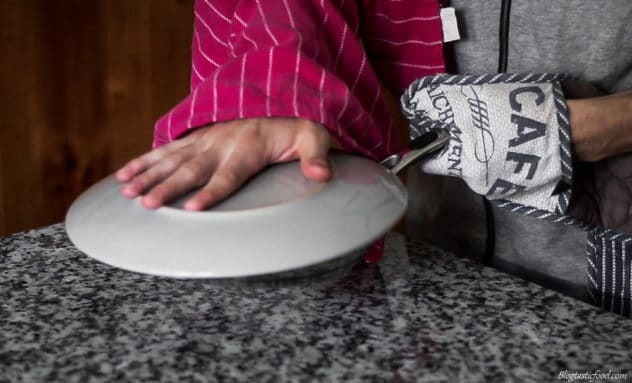 Don’t forget to use a tea-towel or mittens when holding the pan. Get a plate or platter with a larger surface area than the pan. Place the plate over the pan, then flip the tarte tatin on the plate nice and quickly, making sure none of the caramel drips into you. Slowly raise the pan and there you have your tarte tatin. Serve each portion with a nice big dollop of ice-cream and enjoy! 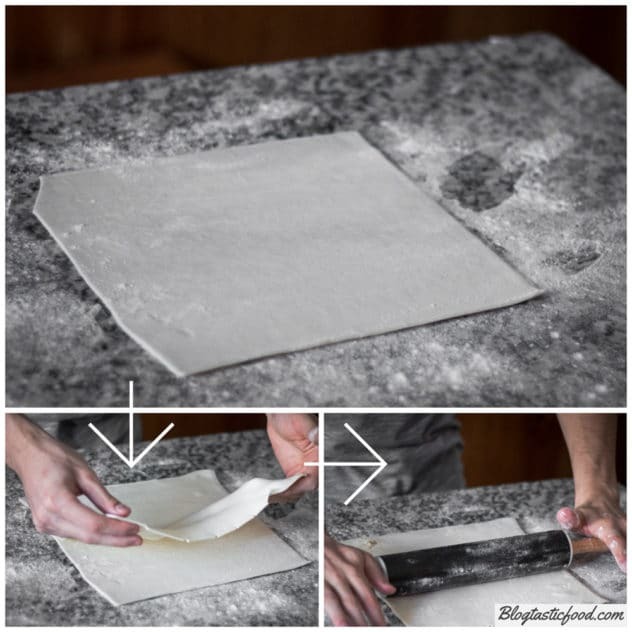 Roll 2 puff pastry sheets against each other to create 1 pastry sheet with a larger surface area. DO NOT touch the syrup/caramel is it bubbles. 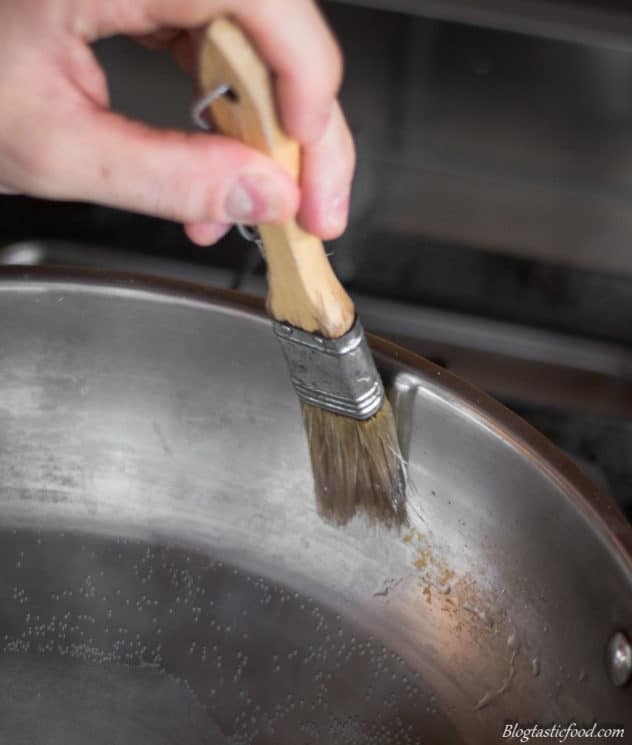 Brush some water around the edges of the pan as the syrup/caramel boils to stop the sugar from crystallising. 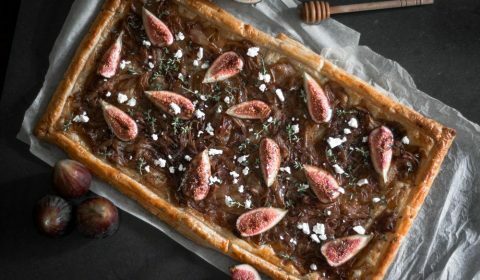 Don't hesitate when you turn the tart and if you want to be extra safe, wrap a tea-towel around your forearm (on the arm that's holding the plate or platter) to make sure the hot caramel doesn't run down your arm. Use granny smith apples, avoid red apples. 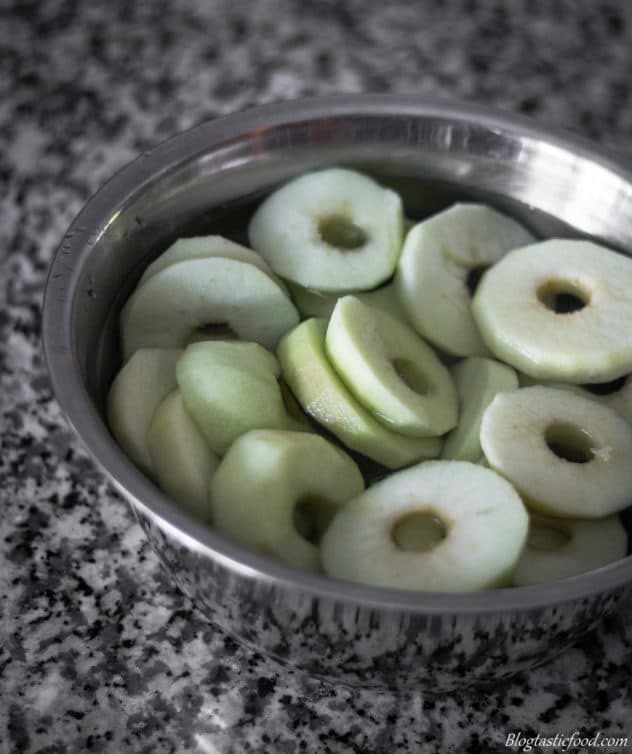 When you peel and cut the apples, place them in a bowl of water to stop them from going brown. Oh, and if you want to check out Donna Hay’s website, Click Here! One of my favorites! Tarte Tatin also has an interesting history on how it came about and its journey to being so well known. Thanks for sharing. Oh Nick… this looks amazing!! One of my all time favourite desserts. And throw the words “super easy” in before.. and well, I am sold!! 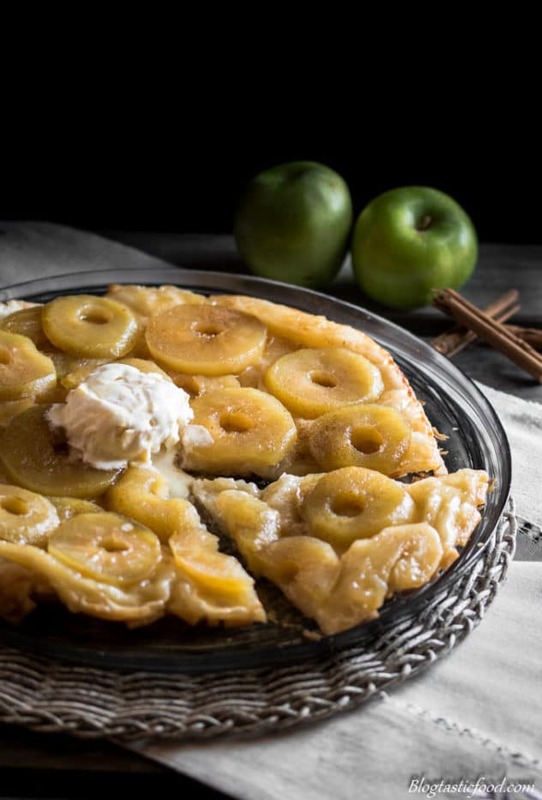 So many useful tips to have a Tarte Tatin come out perfectly like yours…thanks.